Sparrows have a day. They do – March 20th is World Sparrow Day. 24 hours dedicated to raising awareness of this little brown bird. And why not? Sparrow populations are declining (in England at least) and, even if they weren’t, these perky wee birds deserve to be noticed more. Sunflowers, however, have gone one better. Sunflowers have a year dedicated to them. 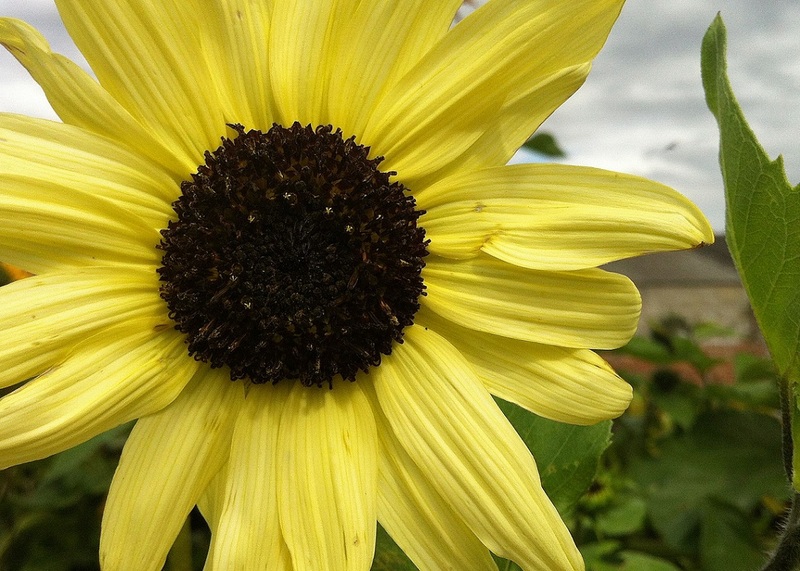 Yes, 2015 is the year of the sunflower. 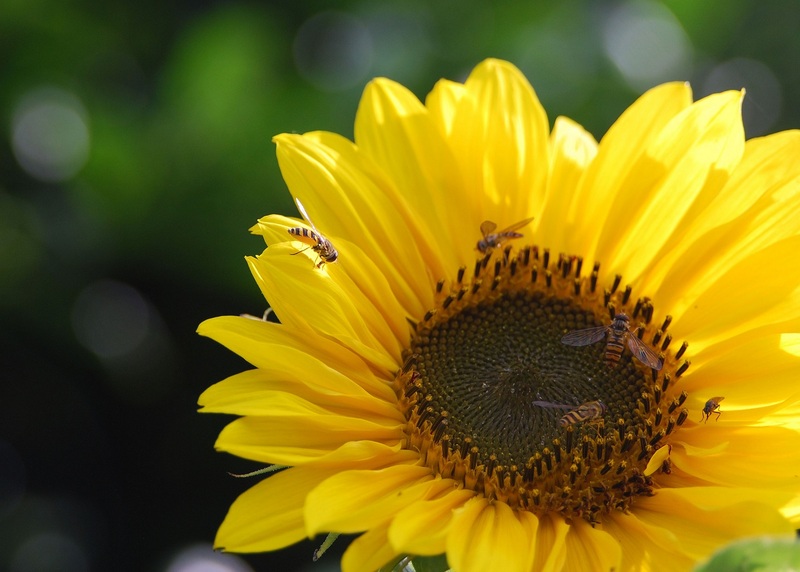 Sunflowers are a lot showier than your average sparrow… maybe that’s why they get a whole year. They’re big (usually) and bright. Bees and hoverflies love them. As soon as the seeds ripen in late summer, birds sneak on in there to snaffle them in all their oily richness. When you think about it, we should all be growing lots of sunflowers every year. Last year I grew ‘Ebony and gold’ for the first time. Big, dinner-plate sized flowers that pulled in the bumblebees… and then got blown down by the first strong wind to hit the top-heavy blooms. The plan was to use them for cut flowers. They have that traditional dark brown centre, surrounded by golden yellow petals that everyone loves. But, as it turned out, the flowers were just too big and I left them on their stems to feed the birds. Well, the ones that didn’t get blown down anyway. This year, if the remaining seeds germinate, I’ll pinch the plants out before they start flowering to see if that encourages more, smaller flowers. If ‘Ebony and Gold’ doesn’t work out, I still have my favourites in the world of sunflowers for cutting. There’s another dark brown and yellow combination, ‘Valentine’, that’s pretty much perfect in an autumnal bouquet. And then there’s the lovely ‘Earthwalker’, which would be my number one choice, but I’m always cautious about the pollen. It looks fine on the flower, not so good when it drops onto a clean, white tablecloth. There is one sunflower I’ve never really got to grips with. ‘Vanilla Ice’ has a more delicate bloom, that falls somewhere between a rudbeckia and a full-on sunflower. It still has the chocolately brown centre, but the petals are more of a soft, creamy yellow. I’ve grown this variety for some years now, but never had much success with it. For me at least, it’s less eager to germinate than a lot of other varieties. And when I do manage to get it from seed to flower… well, the blooms turn out to be very prone to weather damage. But, being as it’s the year of the sunflower, I’ll give it one more go… I have some seed left from last year. 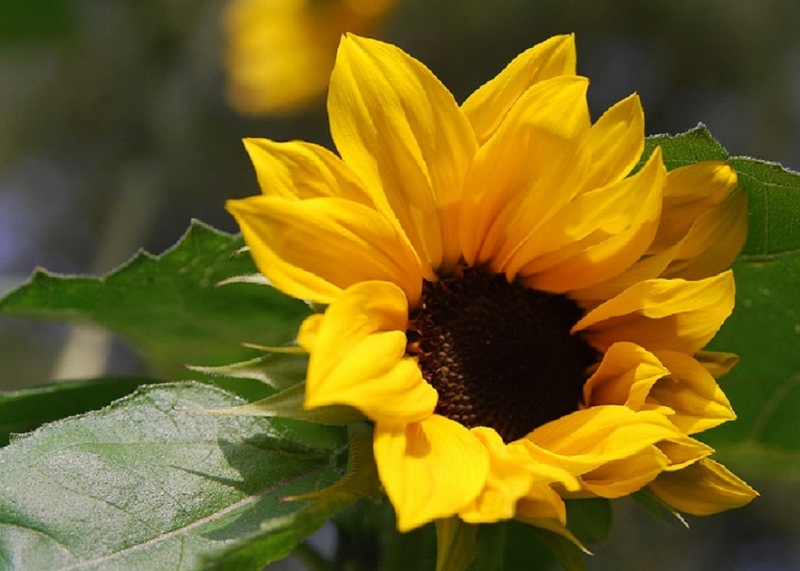 Will you be growing sunflowers in 2015? I was seduced by the sunflowers I grew last year and so have bought several other varieties for this year plus the ones I have seed from last year, I’ll have to be careful when I sow that I don’t end up with a field’s worth. I wasn’t aware that this was the year of the sunflower. I always grow a few sunflowers on my allotment each year, but now I will plant a few extra! It’s lovely to start thinking about summer blooms. How nice that this is the year of the sunflower too. Yes, I will also grow just a few in containers to protect them from the snails. I have chosen Earth Walker and Valentine. Perhaps I saw them on your blog last year? In any case, I remember seeing them on various English blogs last year and chose them for that reason. Vanilla Ice was on the list which got shortened! Lovely post Sarah! You’ve made a very good case for growing sunflowers. I’ve thought of growing them before but never got round to it, but since this is the year of the sunflower I must remedy that. I grew vanilla ice last year. It germinated well and was great for bouquets but I did lose a few in the gales so much better staking needed this year! I had heard it was the year of the sunflower this year so I am trying a few new varieties, red sun, ebony and gold, Italian White and valentine. It was interesting to read how you had found ebony and gold. I think your idea of pinching out to encourage side shoots of more smaller blooms is a good idea. Exciting to think of all these summer flowers! I’m so thrilled that sparrows have their own day! I love them, they are so cute and busy. 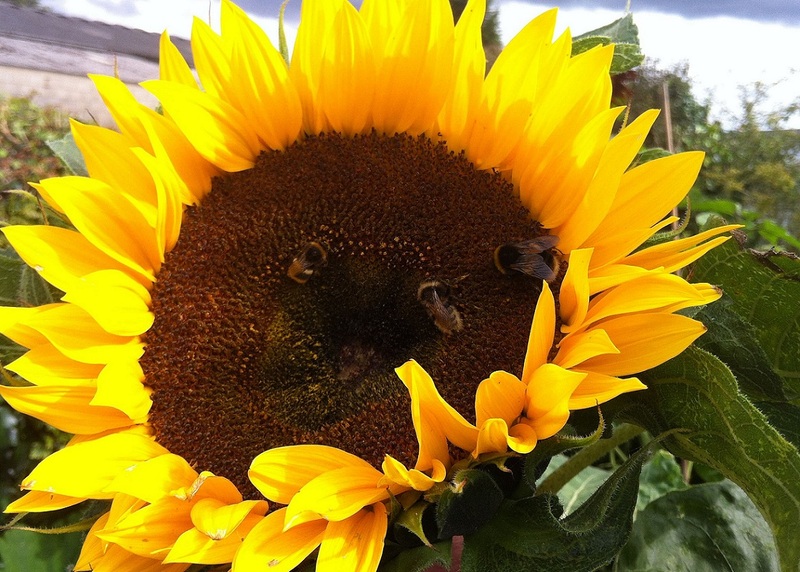 I may be growing sunflowers this year….a workmate has just given me some seeds, am a little scared to try! I love that sparrows have a day. It was national squirrel day a couple of weeks ago too – it’s lovely that our wild creatures have awareness raising days during these less active winter months! I had very tall self-seeded sunflowers in the veg garden last year. I pulled hundreds out as they germinated (sunflowers sprouts are delicious in salads) and left a row behind to grow but I find the tall ones a nuisance. They’re likely to keel over in the wind so need propping up, the seeds get everywhere and I’m too short to get a decent photo when the flower heads are at twice my height! This year I’ve found some seeds for a multi headed bush variety that can be grown as a hedge plus a slightly taller sunflower at just over a metre high that can be used as a cut flower and pinched out for many side shoots (Prado Yellow from T+M). Love the idea of this being the Year of the Sunflower! It’s so great to hear from you again, and withsuch a bright happy post! I’ve missed you GD.